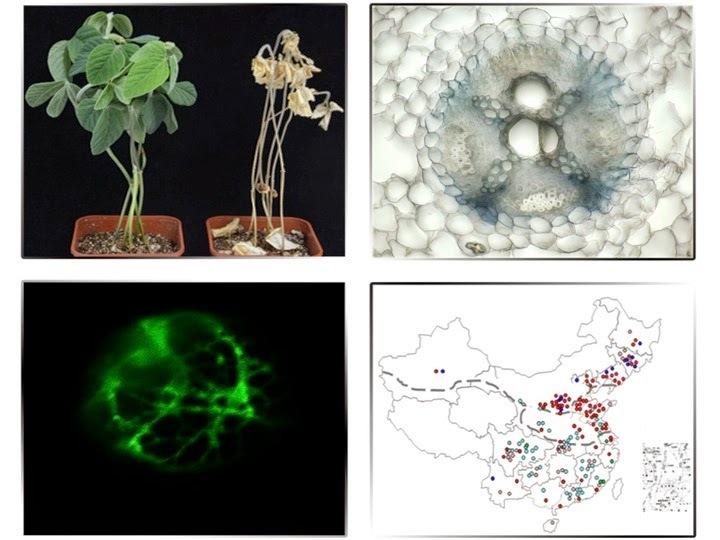 Our collaborative research project with researchers at the Institute of Crop Sciences, Chinese Academy of Agricultural Sciences has been published in the Plant Journal as a feature article. Identification of genes that improve crop salt tolerance is essential for the effective utilization of saline soils by agriculture. Our findings identify a gene that has great potential for the improvement of salt tolerance of commercial soybean varieties. The paper outlines how natural selection and domestication has led to mutations in the sequence of the gene and in many cases loss of its function. This has led to a loss in salt tolerance in many commercial varieties of soybean. Fine mapping was used in a soybean [Glycine max (L.) Merr.] population derived from the commercial cultivars Tiefeng 8 and 85-140, to identify GmSALT3 (SALt Tolerance-associated gene on chromosome 3), a dominant gene associated with limiting shoot sodium ion (Na+) accumulation and a substantial enhancement in soybean salt tolerance. This illustration shows the phenotypic variation between Tiefeng 8 and 85-140 treated with 200 mM NaCl for 18 d (top left); the tissue localisation of GmSALT3 within root phloem- and xylem-associated cells in the salt-tolerant parent Tiefeng 8 (top right); the subcellular localisation of GmSALT3 to ER in Nicotiana benthamiana protoplasts (bottom left); and, the distribution of different sequences for the GmSALT3 gene across China (bottom right). The identified gene is from the cation-proton exchanger family which is expressed in vascular associated cells of the root. It produces a protein likely to be present on the ER. The exact role of this protein in conferring salt tolerance is still under investigation. By studying the sequence of the gene in 184 soybean varieties and 57 wild soybean it is shown that natural variation in the sequence amongst different soybean has led to loss of function of this gene in certain areas. The geographical origin of the soybean with a loss in salt tolerance coincides with areas of low soil salinity. The non-functional gene has entered many breeding programs and is consequently present in commercial varieties of soybean. Our findings will allow breeders to reintroduce the functional gene through either conventional or GM techniques, to improve commercial soybean salt tolerance. This research has been supported by the Natural Science Foundation of China and National Key Technologies R&D Program in the 12th 5-Year Plan and the Australian Research Council. See further info here in these releases from the PEB and the University of Adelaide. Assoc. Prof. Matthew Gilliham and PhD Student Yue Qu (joint-first author) ARC Centre of Excellence in Plant Energy Biology, University of Adelaide).